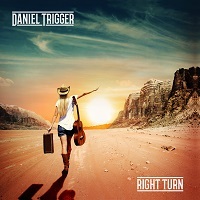 Time for some good ol’ rock n’ roll with DANIEL TRIGGER’s “Right Turn”. The artwork of the album shows an image of a girl with her luggage and acoustic guitar taking on a desert during an early sunset. The image is full of life, joy and positive vibe which gives us an immediate perception of what the album might bring. As advertised, the album is full of beautiful melodies and big hooks. Daniel’s chilling voice suits perfectly well with the sound of classic rock n roll, and not only that – it also brings a very positive atmosphere to the songs. Right from the opening song, you’ll know that this record will be another classic and will further kick up Daniel Trigger’s reputation in this music genre. Songs “Penitence” and “Days Gone By” come in with a very ear soothing tune and relaxing musicality, while possessing an irresistible charisma. The vocals is so friendly too – anyone can sing along with it. This for me makes the songs extra special. Imagine performing these in front of a crowd of twenty thousand people and everyone starts singing along. Daniel then shows the vastness of his arsenal as he goes mellow with the most parts of “Drive”. Still chilling and relaxing, this song will give you one of the best sound therapies you’ll have. The guitar solo is exceptional. It’s so sharp yet so melodic and graceful. The next song “Running into the Wind” opens with a loud and energetic intro, then transitions to a calmer mood and then back to a large chorus, making it a very memorable track. This song will make a perfect example of what a party rock song is. The guitar riffs accompanied with the piano makes a perfect background to Daniel’s voice. Another excellent feature is the solo that will surely make you lose yourself. Try listening to this song with your earphones in the office and you’ll understand what I’m talking about. “Heavy Heart” is a song about a heart break – but not the typical radio song you’ll sing about 15 year old boys whining about it. Yes, it’s an emotional song, but it focuses on all the strength he has inside of him. It sends a message that instead of being a cry-baby, one must rediscover how they were able to live a happy life without a partner and do it again after a heart break. The message in the song is applicable to everyone. In the last two songs, “Rock N Roll Party” and “Wheels in Motion”, Daniel goes all-out rock n roll. With high energies and very sing-able tunes, these tracks make very good anthems. With “Rock N Roll Party”, Daniel can carelessly sing onstage while watching all the people go crazy dancing their asses off. “Wheels in Motion” is almost the same in terms of energy and intensity. The difference is that it’s a lot heavier, borrowing some elements of the NWOBHM. With this yet another astonishing record, DANIEL TRIGGER jumps up his reputation into a higher level. Rock N Roll is not dead, fellas. You just need to find the right artists, and DANIEL TRIGGER is one of them. Two thumbs up to this record.